Well, this year is a Leap Year and today is the extra day in February known as “Leap Day.” I have to post today because it is Leap Day. I won’t get another chance like this for four years. Today has, for the most part, been a relatively normal day. That is a good thing. As I have lived out this relatively normal Leap Day today, I have been reflecting on the passing of time and on the eleven Leap Years that I have experienced in my life. 1968--I don’t remember much about this Leap Year as I was only two years old. 1972--We moved into a new house on an acre on my grandparents’ farm. I was going into the second grade. This was a significant event and beginning in my life. 1976--I remember celebrating the bi-centennial birthday of the United States and I remember that it was the first year I was allowed to drive a tractor—alone. 1980--This was the year that I became a Christian. This was the most significant event of my life. 1984--This was the year that I graduated from high school and headed for college. I attended Northwest Nazarene College. This was a significant event in my life. 1988--This was the year that I graduated from college. My wife, Dina and I were married in December of 1987 so this was the first full year of our married life. 1992--We were living in Baker City, Oregon at this time. I was working as a full-time music minister in a church. Dina and I spent three weeks in Guatemala, Central America on a ministry trip. At this time I was in the midst of working on a Master’s Degree in Education. 1996--Sweet little Sarah was born (our second daughter). Our oldest daughter, Becca, was two years old. We were living in Baker City, Oregon. I was working as a full-time associate pastor in a church. 2000--We were living in Boise, Idaho. Dina was a stay at home mom, caring for two wonderful little girls. I was working as an assistant principal in a public school and serving as a bi-vocational pastor/music minister in a church. 2004--We were still living in Boise, Idaho. Dina was a stay at home mom and was very involved as a parent volunteer in our daughters' elementary school. I was working as an assistant principal in a different school district and serving as a bi- vocational pastor/music minister in a church. I was also in the midst of working on a Master’s Degree in Religion/Spiritual Formation. 2008--We are living in South Korea. We are working/ministering at an International Christian School and enjoying the adventure. Lord willing, if I am granted the opportunity to enjoy another Leap Year/Day in 2012 things will look very different. As the mist of my life rises to the heavens and disperses over the next four years or forty years, I want to do the Lord’s will; I want to do the good I ought to do; I want to love the Lord with all that I am; I want to savor the moments of life with my family and friends and I want to live each day—even the normal ones—in a way that recognizes that life is a unique gift from God. Today, February 29, 2008, won’t come around again in four years. It is one of kind. I know that winter, in my home state of Idaho, has been a snowy one this year. Let it be known that we are "dealing" with and enjoying snow here in South Korea too. The snow was beautiful, but as I write—it is gone. The signs of spring are everywhere. This past weekend I attended a men’s retreat that was held in a large hotel/convention center in Mokcheon, South Korea. Located near the hotel was a large aquatic center that featured, water slides, swimming pools, wave pools, hot tubs and……............ Doctor Fish. In the center of the complex there was an area that featured two tubs of doctor fish. For a small fee people could sit on the edge of the tubs and let the doctor fish nibble at their feet. Sounds freaky doesn’t it? It was. Doctor fish are little freshwater fish that feed off of the dead skin cells of people. They only eat the dead skin and they leave the clean healthy skin. Doctor fish are used to help people that deal with psoriasis and other skin diseases and they are popular at health spas because they leave otherwise rough skin looking clean and smooth. A bunch of the guys from the retreat converged on the aquatic center and took the plunge into the Doctor Fish pool. It was a weird experience. It just didn’t feel right to “let” a fish nibble on my toes. I wanted to jerk away, but didn’t. At times there were scores of fish nibbling away at my feet at one time. It didn’t hurt, it felt like the prickles that you feel when your foot is waking up after having fallen asleep. The Doctor Fish did their job. All of the dead skin and calluses were gone after the fish got through. It was an interesting experience. We have pizza delivered to our apartment every once in awhile. If you look closely at this picture on the pizza box you will see why ordering pizza is just a little taste of home for us. "The disciple is one who, intent upon becoming Christlike and so dwelling in his "faith and practice," systematically and progressively rearranges his affairs to that end." Where do you spend your time? On what do you focus your efforts? This quote by Willard is a great one. All of us are being formed in one way or another. As disciples of Jesus we have the privilege of working out the amazing grace that God has and is working into our lives. Your life with God is not something that happened. It is something that is happening. It is a relationship where the God of love and grace constantly initiates and where you are to faithfully attend, respond and obey. In verse 11 Paul exhorts Timothy to run from “evil things”. In fact, he is telling Timothy to run from the many things that he mentioned earlier in the letter. As we consider Paul’s words to Timothy, it is important that we understand the context of his letter and that we know specifically the “evil things” from which Timothy is to “run”. The letter of 1 Timothy was written by the Apostle Paul to his friend Timothy, the leader at the church in Ephesus. The church was a young church and in Paul’s absence had been infiltrated by false teachers. Timothy was sent to lead the church through this challenging situation. Paul wrote the letter to encourage Timothy and to advise him on how to confront the difficult issues in the church. Specifically, in chapter 6, Paul instructs Timothy on how to deal with those in the church that are focused solely upon making money and who are perverting the message of the gospel. The false teachers have come into the church preaching a message of compromise—proclaiming a cheap grace of “ease and happiness” in contrast to Paul’s preaching of commitment to Christ and love of others. Their debates, arguing and quibbling over Paul’s words were gaining them attention and stirring up dissention within the church and all the while they were garnering support—specifically, financial support (which is by design). The religion of the false teachers was focused upon the gaining of wealth and living a life of ease, luxury and extravagance. “A man [person] of God” is an important descriptor used here by Paul. Timothy was a follower of Jesus Christ. His life was set aside for noble purposes—to be used as an instrument for God. His life was not his own it was bought at the high price of the precious blood of Jesus upon the cross. Timothy was “a man of God” but he was also a human being and humans are susceptible to temptation. There is evil that we are to fight and there is evil that we are to run from. Timothy was facing the kind that we are to run from. The people of God are to run from the evil things that lead to temptation and sin. To stand still in the face of these types of situations would mean certain death. Do you have a temptation that is difficult to resist? Are you feeling the weight of evil things and wicked thoughts as they press in on you? Take Paul’s advice and run. The smart thing to do is to remove yourself from the temptation and run from anything that might produce sin in your life. Running from evil is not cowardly, it is courageous. Running from temptation that could lead to sin is not a sign of weakness, it is a sign of wisdom. Just like Timothy, you are a child of God, bought with a price and filled with the Holy Spirit to be used of God for His glory. The evil of sin and its consequences will only serve to trip you up and stand in the way of your service unto God. Heed Paul’s instructions—when faced with temptation, remember who you are and whose you are and……Run. The Roberts family just spent the last two days in Seoul, South Korea participating in the "30 Hour Famine" event sponsored by World Vision. The "30 Hour Famine" is an international youth activity focused on fighting world hunger. More than 852 million people in the world are malnourished and 153 million of them are under the age of 5? Each DAY over 29,000 kids die from preventable diseases related to malnutrition? Over the last couple of weeks Becca and Sarah have been raising money by talking to people about the needs of the world around them and explaining the goal of the 30 Hour Famine activity. After raising money they personally started on a journey of raising their own awareness of the needs of the world around them by embarking upon a 30 hour fast. The goals of this time of fasting were to draw closer to God and to "feel" in a just small way, the hunger that many of the children in the world experience everyday. 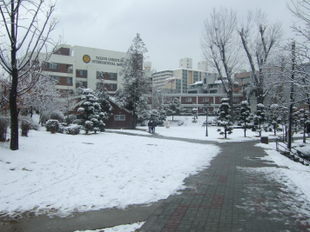 The Famine event was held at Seoul Foreign School in Seoul, South Korea. Thirty-five TCIS Middle School students boarded the bus at 1:00 p.m. on Friday and joined with 100+ Seoul Foreign Middle Schoolers at the Famine event 3 hours later. The afternoon and evening activities included: times of corporate praise and worship, devotional activities, Bible study, prayer time, study of impoverished nations around the world, games and activities, silly skits, a "We're So Rich" Nooma video by Rob Bell and testimonies from high school students that have been involved in the Famine activity in previous years. After a short night of sleep the "30 Hour Famine" group kicked off the morning with a time of singing and praising the Lord and a great message by Mr. Mike, the TCIS Student Life Minister, about how life is not to be all about "Me" but rather it is to be all about "God" and "Others." The Famine ended with a time of all of the students praying for the world and serving one another juice and muffins. It was a super time and a great event. For more info on the "30 Hour Famine" click HERE. Valentine’s Day as a Daddy of two little girls used to be fun. I would get my sweet hearts some candy, flowers and stuffed animals and they would ooh, aah, kiss me, hug me and thank me. Valentine’s Day as a Dad of two beautiful middle school girls…..stinks. I still get my sweet hearts candy and flowers and such but the problem is—I am not the only one buying these items for them. Boys have entered the picture. I am ready to break Cupid’s bow over his cute little head and throw his quiver of arrows into the dumpster! Is there any such thing as a Valentine’s Day Scrooge? The tendency is strong to say—“O God won’t be so stern as to expect me to give up that!” but He will; “He won’t expect me to walk in the light so that I have nothing to hide,” but He will; “He won’t expect me to draw on His grace for everything” but He will. How can a God of love be so strict and demanding? How can a God of love be so unbending and rigid? How can a God of love be so jealous? These questions arise because of our wrong understanding of what constitutes genuine love. How can a God who truly loves you and me and who is only interested in what is best for us, appear to be anything but these things? In John 15:12-14 Jesus says, "My command is this: Love each other as I have loved you. Greater love has no one than this, that he lay down his life for his friends. You are my friends if you do what I command." In these verses we see a glimpse of the love that God has for us. The greatest love is realized in Jesus dying upon the cross for our sins. Have you forgotten how much He loves you? Have you taken the love of God for granted? It is easy to do. When we take our eyes off of Jesus and put them on our wants, our needs, our desires and our happiness, we tend to forget how much he really loves us. We forget when we substitute the abandoned, protective, self-sacrificing love that God has for us, for a love that is tolerant of our wishes, understanding of our wanderings, and accepting of our independence. Surely Jesus just wants us to be happy, doesn't he? As we take our eyes off of the cross and put them on ourselves, the lines between happiness and holiness begin to blur. God doesn't want us to be happy—he wants something better for us. He wants us to be whole and complete. He wants us to be holy. Holiness is only realized as we live in obedience to and relationship with God. "You are my friends if you do what I command." In love He expects us to give up that thing that controls us; He expects us to walk in the way of transparency and integrity and He expects us to trust in Him as we live our lives. He expects . . . because He loves.